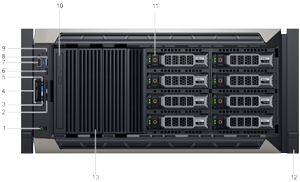 El servidor Dell PowerEdge T640 le permitirá realizar ampliaciones conforme evolucionen sus cargas de trabajo con un rendimiento máximo de un servidor de 2 sockets y una enorme capacidad de almacenamiento interno. 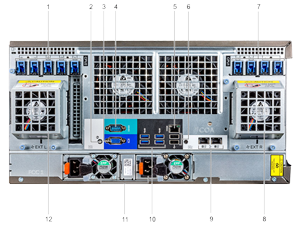 El modelo PowerEdge T640 es un servidor potente y versátil ideal para las oficinas medianas, los sitios remotos y los centros de datos. 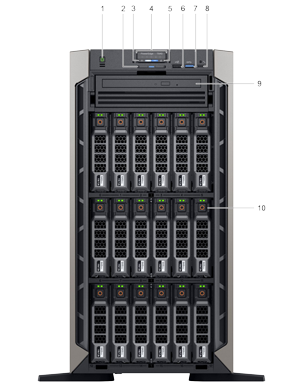 El servidor T640 combina un potente rendimiento y una enorme capacidad de almacenamiento interno en una plataforma torre o para rack. Haga frente a una amplia gama de cargas de trabajo y prepare su centro de datos para el futuro gracias a opciones flexibles de almacenamiento, rendimiento y E/S. Disfrute de una arquitectura completa y ciberresistente con seguridad integrada en cada servidor que le ayuda a proteger sus datos. Indicates the system health. For more information, see the System health and system ID indicator codes section. Indicates if the iDRAC Quick Sync 2 wireless option is activated. The Quick Sync 2 feature allows management of the system using mobile devices. This feature aggregates hardware/firmware inventory and various system level diagnostic/error information that can be used in troubleshooting the system. 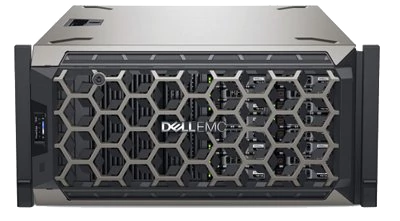 You can access system inventory, Dell Lifecycle Controller logs or system logs, system health status, and also configure iDRAC, BIOS, and networking parameters. You can also launch the virtual Keyboard, Video, and Mouse (KVM) viewer and virtual Kernel based Virtual Machine (KVM), on a supported mobile device. For more information, see the Integrated Dell Remote Access Controller User’s Guide atDell.com/idracmanuals. This USB port is USB 2.0 compliant. The USB port is USB 3.0 compliant. The iDRAC Direct port is micro USB 2.0-compliant. This port enables you to access the iDRAC Direct features. For more information, see the iDRAC User’s Guide atDell.com/idracmanuals. 9 Optical drive (optional) N/A One optional slim SATA DVD-ROM drive or DVD+/-RW drive. The expansion slot(s) enable you to connect PCI Express expansion cards. For more information on the expansion cards that are supported on your system, see the Expansion card guidelines. Enables you to remotely access iDRAC. For more information, see the iDRAC User’s Guide at Dell.com/idracmanuals. 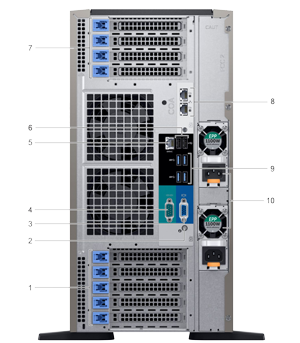 NOTE: The LOM (Broadcom 57416) is compatible with 10GBASE-T IEEE 802.3an and 1000 BASE-T IEEE 802.3ab. Indicates if the iDRAC Quick Sync 2 wireless option is activated. The Quick Sync 2 feature allows management of the system using mobile devices. This feature aggregates hardware/firmware inventory and various system level diagnostic/error information that can be used in troubleshooting the system. 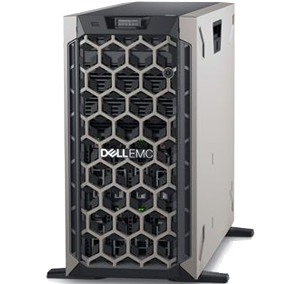 You can access system inventory, Dell Lifecycle Controller logs or system logs, system health status, and also configure iDRAC, BIOS, and networking parameters. You can also launch the virtual Keyboard, Video, and Mouse (KVM) viewer and virtual Kernel based Virtual Machine (KVM), on a supported mobile device. For more information, see the Integrated Dell Remote Access Controller User’s Guide at Dell.com/idracmanuals. 10 Optical drive (optional) N/A One optional slim SATA DVD-ROM drive or DVD+/-RW drive.